Warning! 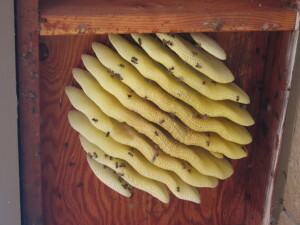 If you have a swarm of bees that are threatening the safety of you, your family or your neighbors, don’t hesitate – call your Los Alamitos bee removal experts at Bee Busters! If you are a dog lover, you and your pet will have a great time in Los Alamitos — the city boasts the two and half acre, Arbor Dog Park. This park has several huge shade trees and is fenced with concrete enclosures for easy exit and entry to the park. The park facilities include parking, drinking fountains for both you and your dog, trash cans in the park and coke and water machines outside the fenced park. Besides this beautiful dog park, you can also spend some great time in Oak Site, which is a 14 acre park with many lighted volleyball courts for you to enjoy a game or two of volleyball on into the warm summer evenings. While enjoying the city, you may see some bees, wasps, yellow jackets and other stinging insects. If you are one of the small percentage of people who are allergic to honey bees, the bee venom can be life threatening. So don’t attempt to remove the bees yourself. 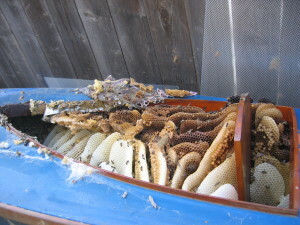 Instead, you should call in Bee Busters, for professional Los Alamitos bee removal services as bee control is a complex and difficult process. Bees are very important to us, they help us by pollinating our crops and many experts understand their value from the production of honey and other products. However they do not belong in your walls and pose more of a threat to safety than benefit to the world while living in your wall spaces or roof. Fortunately Bee Busters has expert beekeepers on hand to help you with your situation. So, if you have a bee problem, do not attempt to handle the problem yourself. 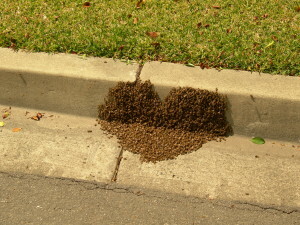 Call Bee Busters, Inc. for Los Alamitos bee removal services at 949-497-6264 or 714-731-1959. Call your Los Alamitos Bee Removal Experts Today!